I’ll admit that when I first visited Gallagher Creek Park, just east of Adams on Silverbell, I didn’t quite get it. It seemed like a rather ordinary, flat piece of land surrounded by a marsh. But luckily, I decided to look more closely and, as usual, the closer I look, the more nature shares with me. I’ve visited the park several times over the last month and each time I appreciate this little park more. The stream flowing quietly through the grass beneath the viewing platform creates a cool, moist retreat for an abundance of birds and the special native plants that love wet feet. The Old Fields bloom with an astonishing variety of native wildflowers. Insects float and buzz between the blossoms. 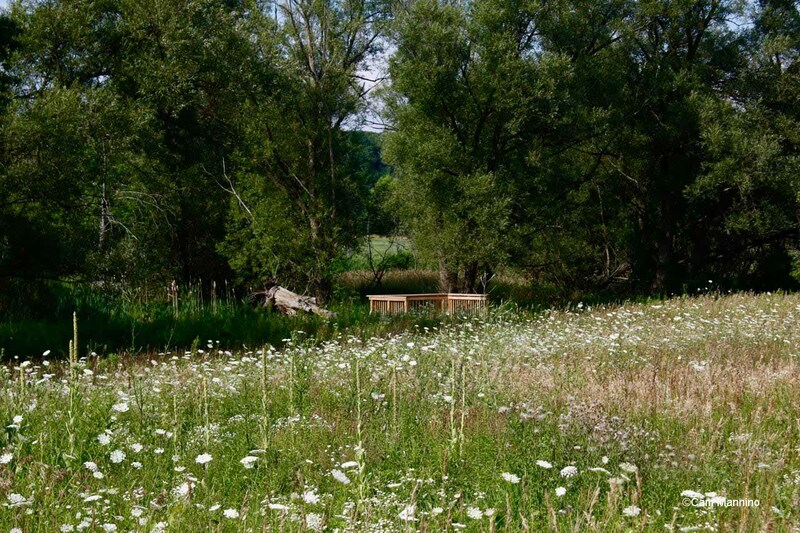 In short, this little park hosts an amazing variety of wildlife and plants with its combination of marsh, wet meadows and open fields (click here to see a map). Let me show you just a sampling. Gallagher Creek among the grasses at the viewing deck. After the last survey, though, they reported that the “gravel riffles and natural pools” had been silted by nearby construction, reducing the population from 300 Brook Trout per mile in 1998 to just 50 per mile in 2010. (See Ben’s blog on this from 2015.) 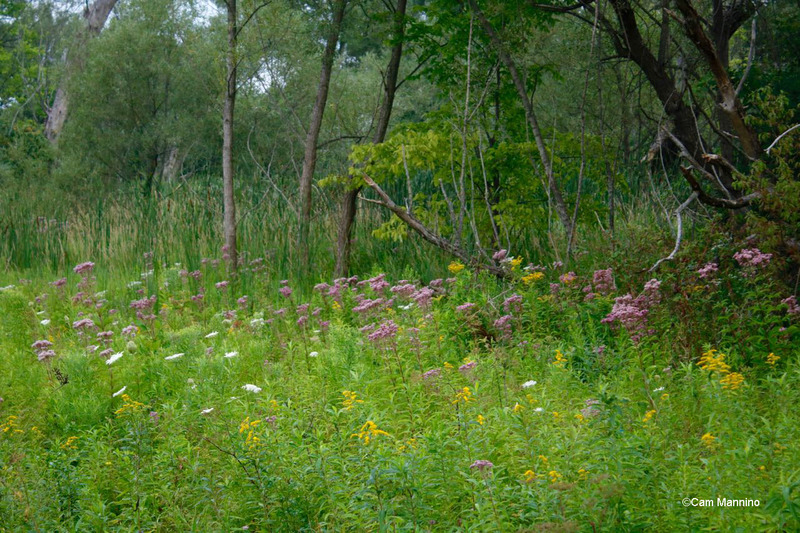 Native plants growing more abundantly at the edges of the park can act as a buffer and filter such sediment. Gallagher Creek runs northeast and enters Paint Creek at the Cider Mill in Goodison. If we want Brook Trout in our township, one way is to protect a cold water stream like Gallagher Creek. Streams like Gallagher Creek create what’s called a “riparian corridor,” an area where the land meets a stream or river that not only filters and purifies water, but also provides habitat for a wide diversity of plants and wildlife. Antonio Xeira, our birder friend, spotted a most impressive bird near the creek. 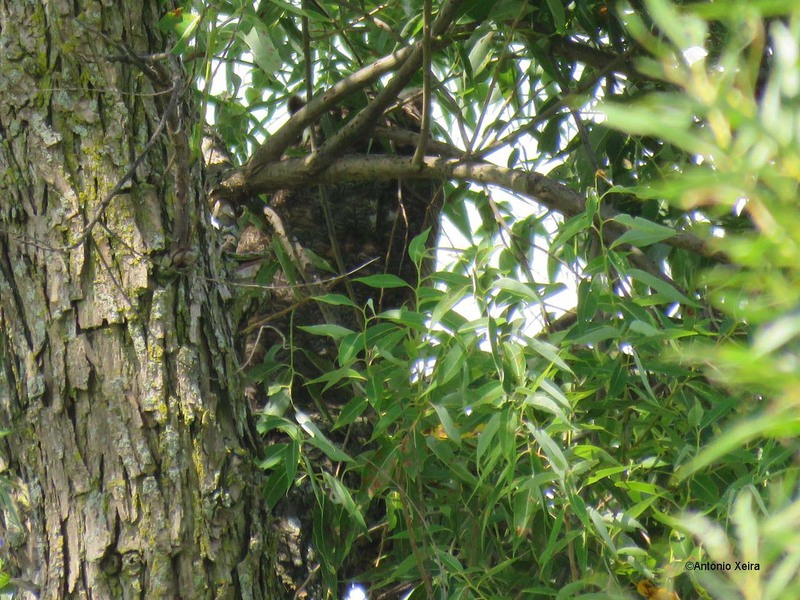 Here’s his photo of a Great Horned Owl (Bubo virginianus) who spends its days high up among the leaves of a Willow (probably black willow, Salix nigra) north of the stream. It’s not easy to see so I appreciate Antonio’s shot! See that open eye? A Great Horned Owl, photographed by Antonio Xeira, spends the day in a large Willow tree to the north of Gallagher Creek. 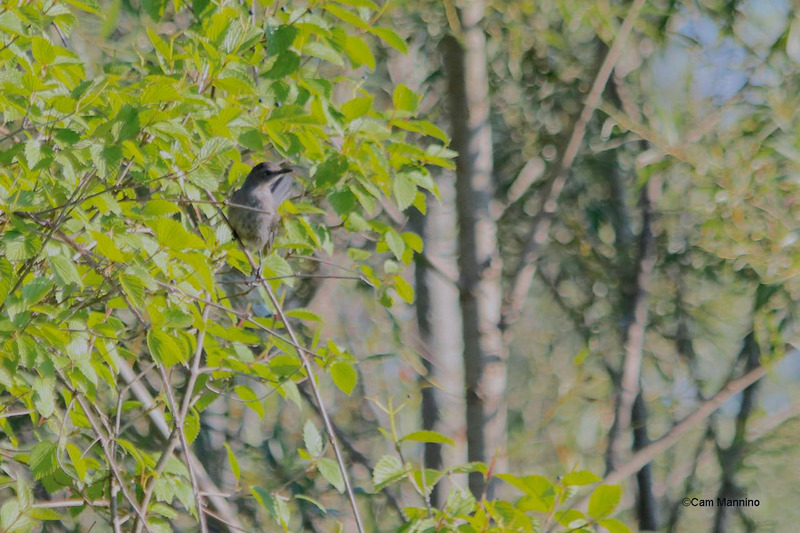 A much smaller visitor among the willows is what I think was a Willow or Alder Flycatcher (Empidonax species) that perched in the shadows to preen. ( It could also be a Eastern Wood-Pewee (Contopus virens), but I’ll leave that for you to decide. They’re very similar.) It was a hot morning and this little bird was very busy dealing with the gnats or mites that can bother birds as much as they can bother us humans this time of year! 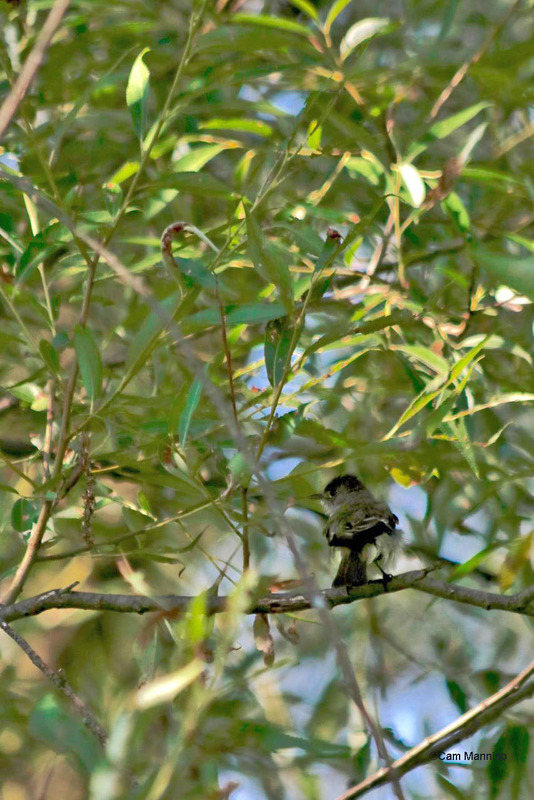 A Willow or Alder Flycatcher or an Eastern Wood-Pewee? You decide which one preened one hot morning in a Black Willow. 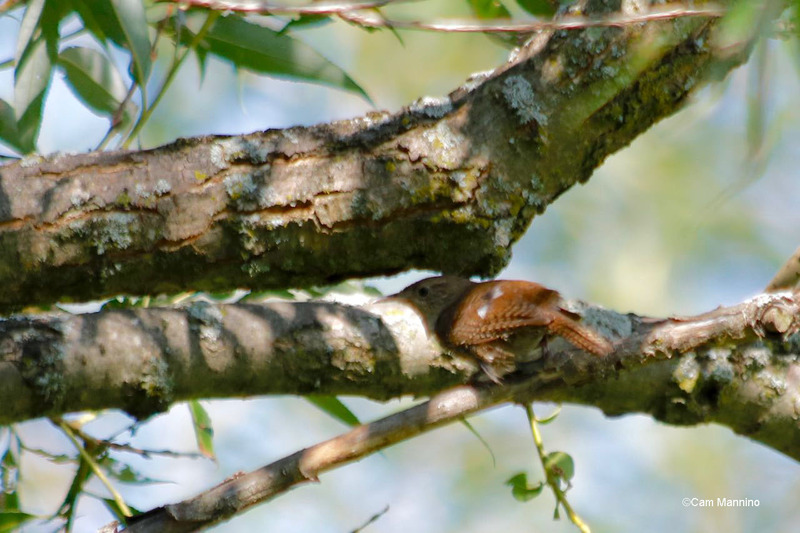 The shade near the stream also provided a stopover for a busy House Wren (Troglodytes aedon). A House Wren stops briefly in the willow’s shade on a hot morning. This hard-working adult was foraging for her young in a nearby thicket of native Gray Dogwood (Cornus foemina), which provides lots of cover and a food source for all kinds of birds at Gallagher Creek. 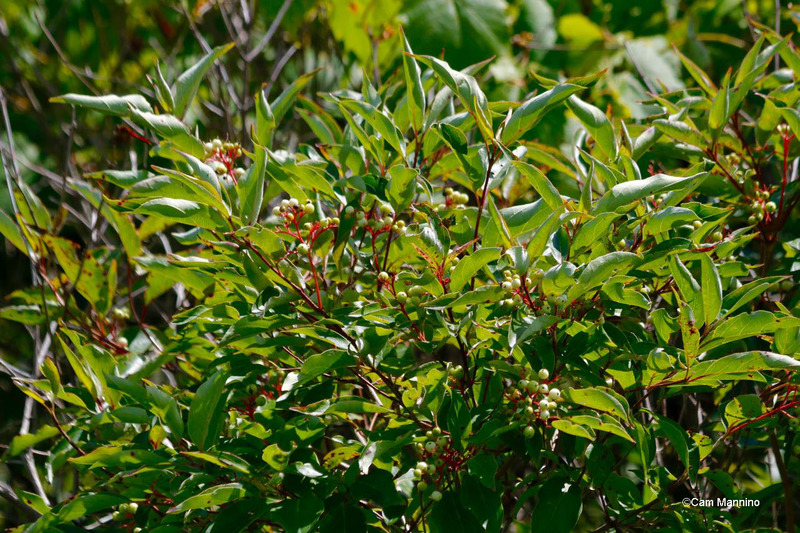 Stands of native Gray Dogwood provide shade, protection and a food source in several thickets around Gallagher Creek. One morning, I approached the thicket to see if I could see the young wren. Immediately, the adult starting her scolding call, chipping incessantly at me, probably both to ward me off and to tell her fledgling to stay back in the trees. I did finally manage to get a shot of the youngster who appeared to still be growing into its beak! 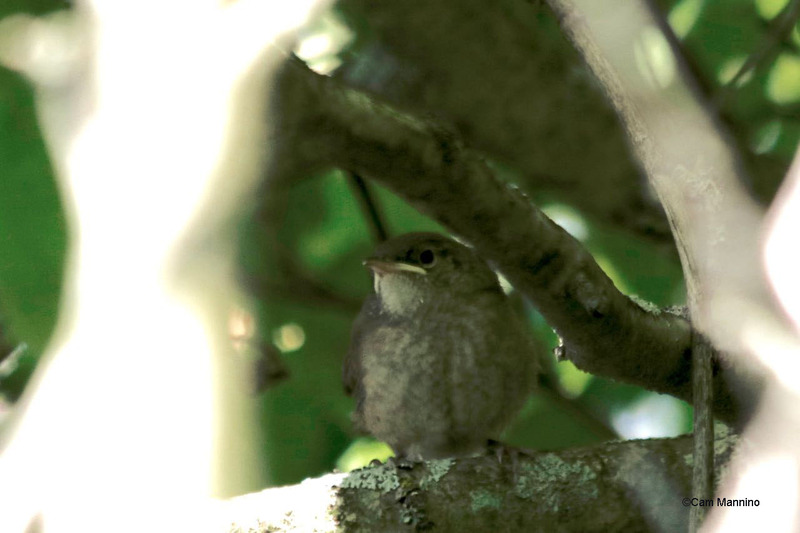 A fledgling House Wren hid deep inside the shade of Gray Dogwood as its mother scolded nearby. Antonio spots a crayfish burrow in May at Gallagher Creek. A crayfish with eggs beneath her tail. Moisture-loving wildflowers in pink, purple, white and yellow bloom among the tall grasses and reeds at the edge of the stream. Here are three native flowers that are easy to spot in the park – Blue Vervain (Verbena hastata), Canada Goldenrod (Solidago canadensis) and Joe Pye (Eutrochium maculatum). The moist ground even a bit farther out from the stream suits many plants. Tall Sunflowers (Helianthus giganteus) and Water Hemlocks (Cicuta maculata), both natives, prefer to sink their roots in moist earth. Tall Sunflower will grow taller during its second year. Sow Thistle in the background. Of course, dragonflies make their home wherever there is water. I saw a mating pair of Ruby Meadowhawks (Sympetrum rubicundulum) making a wheel of their bodies in the wet grass one morning. The female is retrieving sperm from the male’s abdomen where he placed it earlier. And to the right is what I think is another female Ruby Meadowhawk perching near the edge of the stream. Meadowhawk dragonflies (family Libellulidae)are plentiful this time of year and tough to identify, but fascinating to watch as they hunt along the creek. 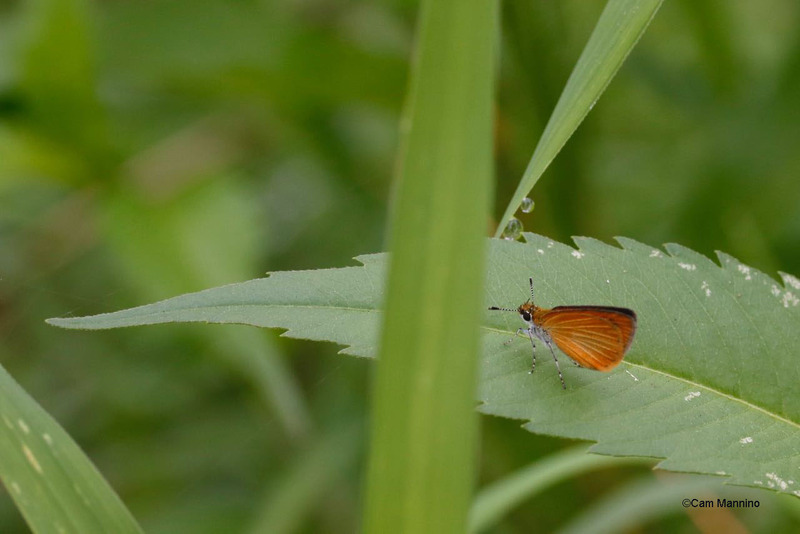 This thumbnail-sized Skipper butterfly (family Hesperiidae), I’m guessing a Delaware Skipper (Anatrytone logan), paused delicately on a moist leaf as I approached the stream. Isn’t it elegant with its striped legs and antennae, large eyes and deep orange wings? A thumbnail-sized member of the Skipper butterfly family, perhaps a Delaware Skipper. 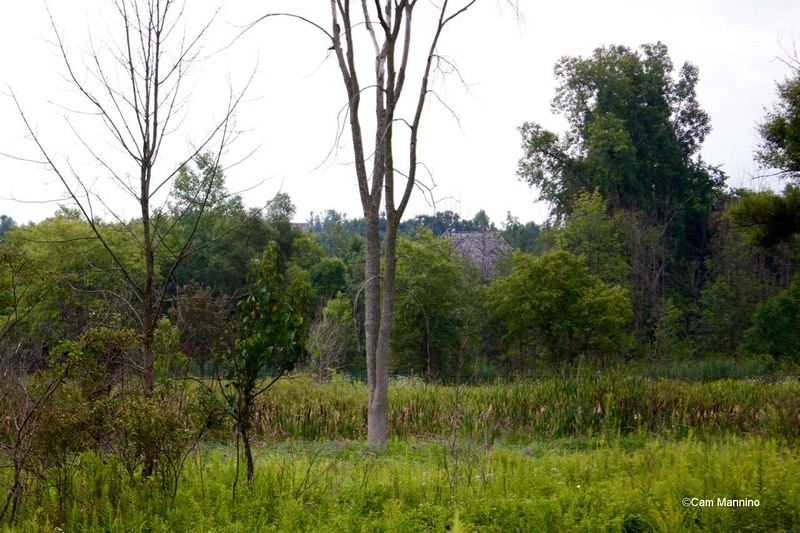 Gallagher Creek Park also shares an emergent marsh with its neighbors to the east. This thriving area is slowly being cleared of the dreaded invasive, Phragmites (Phragmites australis), which is much too prevalent in the area. It’s an on-going project of Dr. Ben and the Parks and Recreation Commision. How wonderful to see natives like sedges (Carex species) and Joe Pye flourishing as that terrible invasive plant diminishes! Native plants like Sedges and Joe Pye flourish in the park’s emergent marsh as the PRC works to eliminate invasive Phragmites. In the spring and early summer, our sharp-eyed birding friend, Antonio, found two nests on open ground at Gallagher Creek. I wonder if these eggs hatched since they seem so vulnerable. On the left is a Killdeer’s nest (Charadrius vociferus) from late April. The name, by the way, comes from their call, not from their effect on deer! And on the right is a Spotted Sandpiper‘s nest (Actitis macularius) in early June. Thanks, Antonio! Now birds whisk in and out of the leafy trees at the perimeter of the Old Field next to the parking lot – many of them juveniles or adults working at feeding them. The “miaou” of a young Gray Catbird (Dumetella carolinensis) caught my attention at the edge of the field. 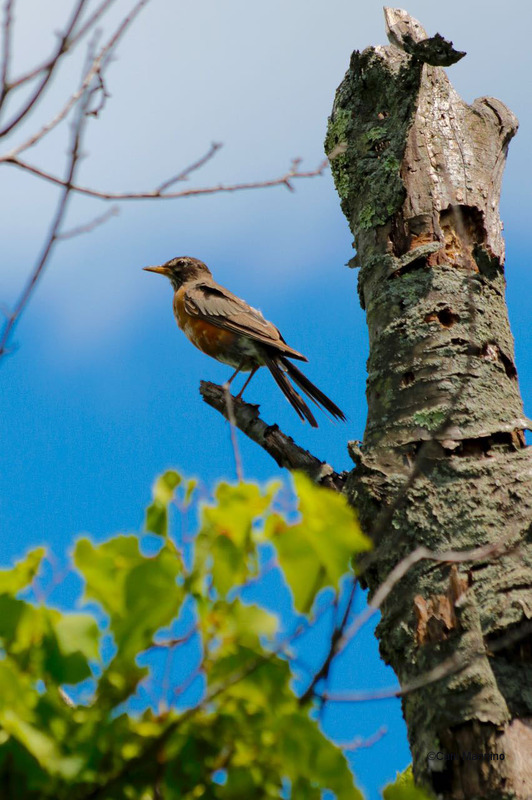 And later hearing a “cluck,” I look up to see an American Robin (Turdus migratorius), perhaps a molting female adult or a juvenile losing its spots, perched at the top of a snag. A young Gray Catbird “miaous” from bushes near the edge of the Old Field. A Robin, perhaps a molting female or a youngster still losing its breast spots, surveys Gallagher Creek. 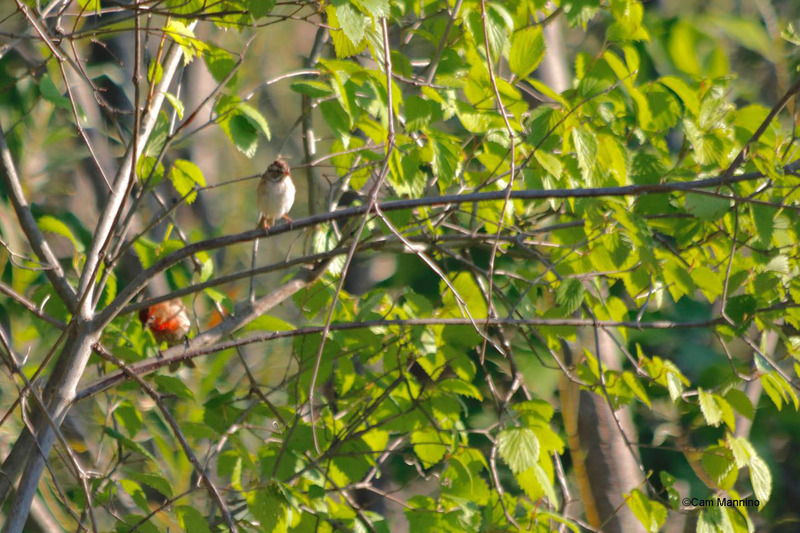 A Chipping Sparrow (Spizella passerina) and a male House Finch (Haemorhous mexicanus) hung out together in the bushes one hot morning. A Chipping Sparrow and a House Finch share a bush one hot summer morning. 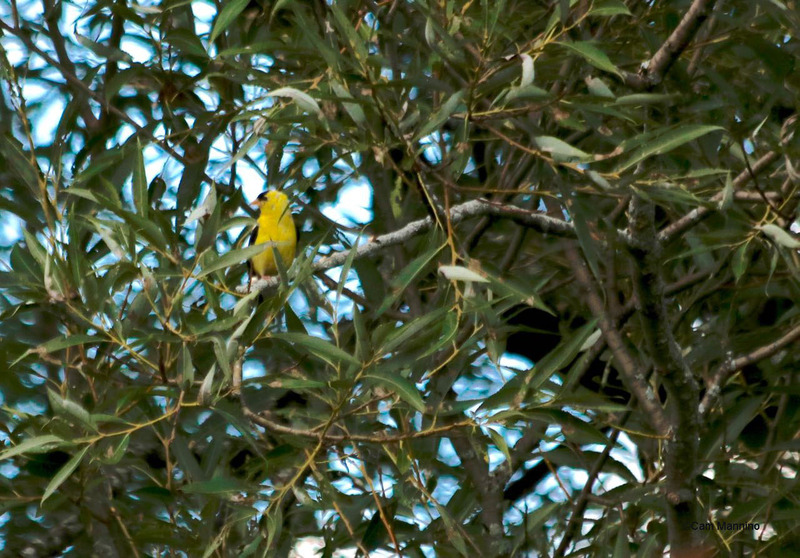 American Goldfinches (Spinus tristis) provide the soundtrack for Gallagher Creek right now. These cheery little birds are one of the few who sing as they fly! With every downward swoop of their undulating flight comes a short burst of song. Here’s a male that settled for a few moments in that Willow, again – a popular place to pause for many of the birds here. A male goldfinch settles in the willow trees, resting from his singing flight in the golfinch mating season. Goldfinches mate in August because their favorite food source is available – thistle seed. So they’re quite happy, I imagine, that non-native Field Thistle (Cirsium arvense) established a large, plumed patch on the western end of the loop path. Goldfinches mate in August when the Field thistles produce their favorite seed. 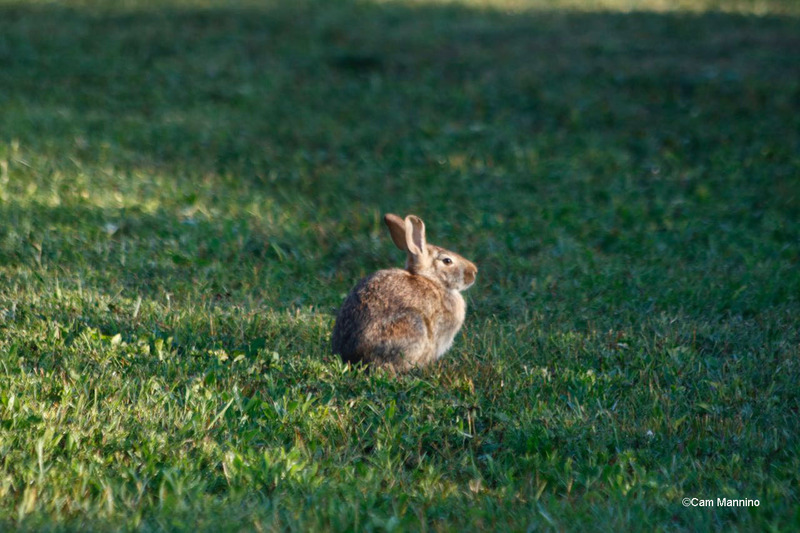 We appreciated being greeted by a relaxed Eastern Cottontail (Sylvilagus floridanus) when parking at Gallagher Creek one morning. It seemed to be enjoying a bit of morning light after a long night of nibbling. An Eastern Cottontail enjoys early morning sun after a long night of nibbling at Gallagher Creek. 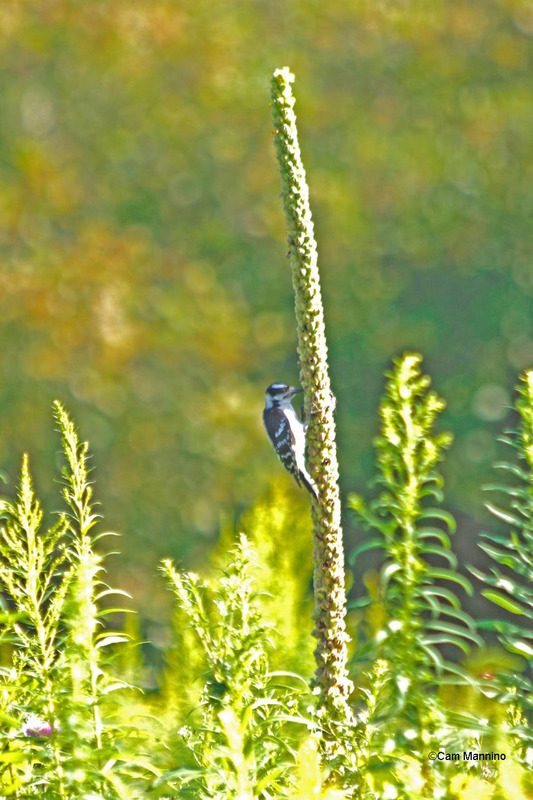 A Downy Woodpecker extracting seeds from a huge non-native plant, Common Mullein. 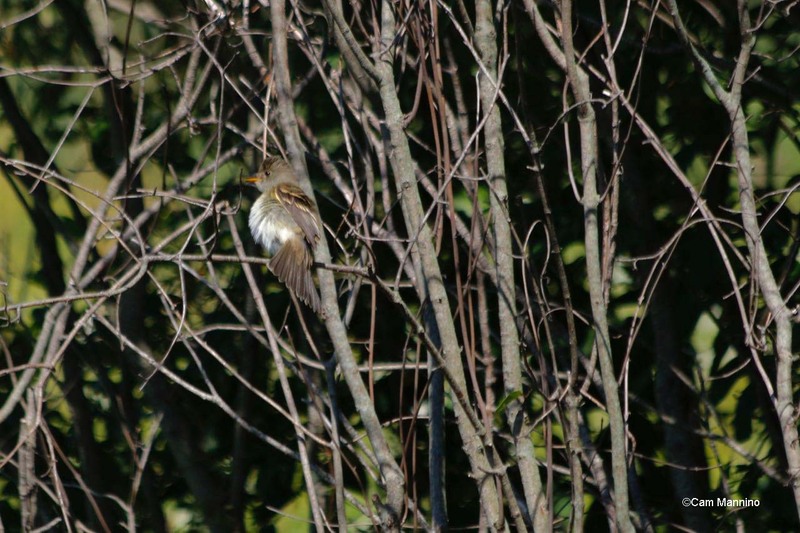 Closer to the water, this small bird fluffed its feathers as it settled in a bush. It looks a lot like the Willow Flycatcher but was a little bigger. So I’m guessing this is an Eastern Wood-Peewee (Contopus virens), but I can’t be sure! I think from its size, this is an Eastern Wood-Pewee, but again, it could be a Flycatcher! Among all the non-native wildflowers, like Queen Anne’s Lace and Spotted Knapweed in the Old Fields, many native wildflowers are increasingly making a home in the Old Fields here. In August of 2014, Dr. Ben did what’s called a floristic survey of Gallagher Creek. Of the 192 species he found on one day there, 131 were native! Today they are more plentiful and healthy because Ben and his summer techs have eliminated many invasive shrubby plants and held repeated prescribed burns here. 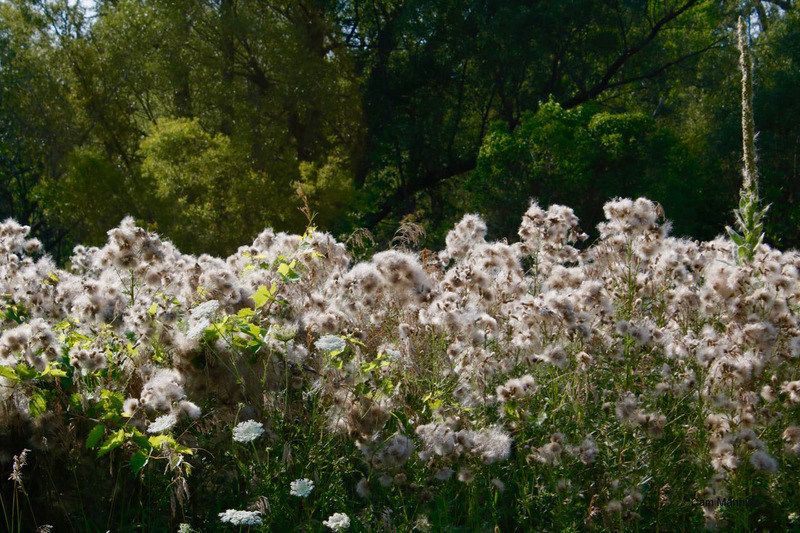 They plan to increase the native plant habitat in this park by planting native prairie species into the areas that were primarily non-native, invasive plants. The first phase of native plant installation will happen fall 2016, with a second round in 2017. Check out the sign on the west side of the driveway just as you enter the parking lot to learn more details. In Bear Creek, Yarrow (Achillea millefolium) is an occasional plant, but this summer, it grew in large swathes along the paths of the field near the parking lot at Gallagher Creek. Now, after the intense heat, it is turning brown and seeding for next spring’s crop. Large patches of native Yarrow flourished along the loop path in the Old Field near the parking lot. With the heat, Yarrow began to produce its brown seeds for next year’s crop. Of course, native Common Milkweed (Asclepias syriaca) appears here and there, and is now producing its green, paisley-shaped pods. Along with more common Canada Goldenrod, another native called Grass-leaved Goldenrod (Euthamia graminifolia), flourishes as well. As I reminded readers last summer, Goldenrods do not cause “hay fever.” Their pollen is heavy and drops quickly to the ground. The sneeze-producing culprit that blooms at the same time is the wind-pollinated Ragweed (genus Ambrosia) which you can see if you click on the link. Common Milkweed forming nice plump seed pods. One of our many native Goldenrods, Grass-leaved Goldenrod. 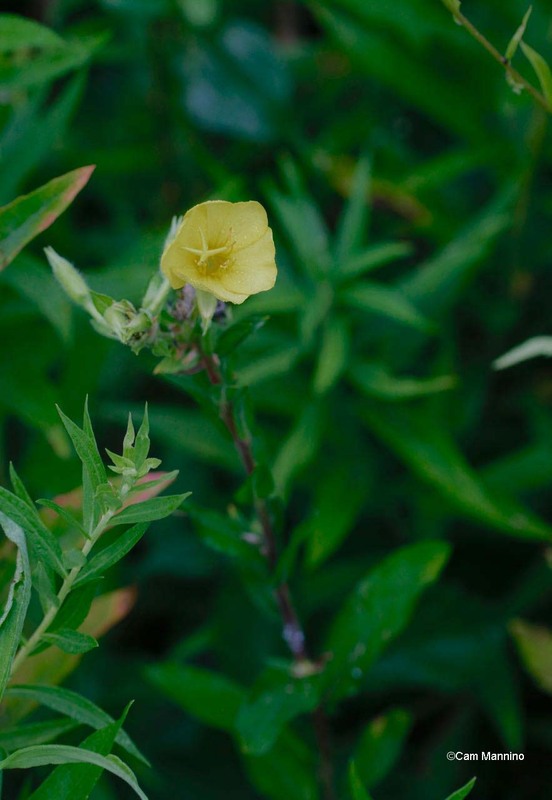 Common Evening Primrose (Oenothera biennis) raises its graceful stems topped by yellow flowers among the grasses to the east of the park. According to the Illinois Wildflower site (one of my faves), these flowers “remain open from evening to early morning, but will remain open longer on cloudy days. They have a mild lemony scent, and bloom from mid-summer to fall on mature plants. Long narrow seedpods develop, which split open from the top to release many tiny, irregular brown seeds. They are small enough to be dispersed by the wind, and can remain viable in the soil after 70 years.” So if we keep caring for the land here, these night-blooming natives should be here for your grandchildren! Common Evening Primrose open as the sun goes down and don’t close until morning. Out in the Old Fields, insects are busy in the late summer sun. 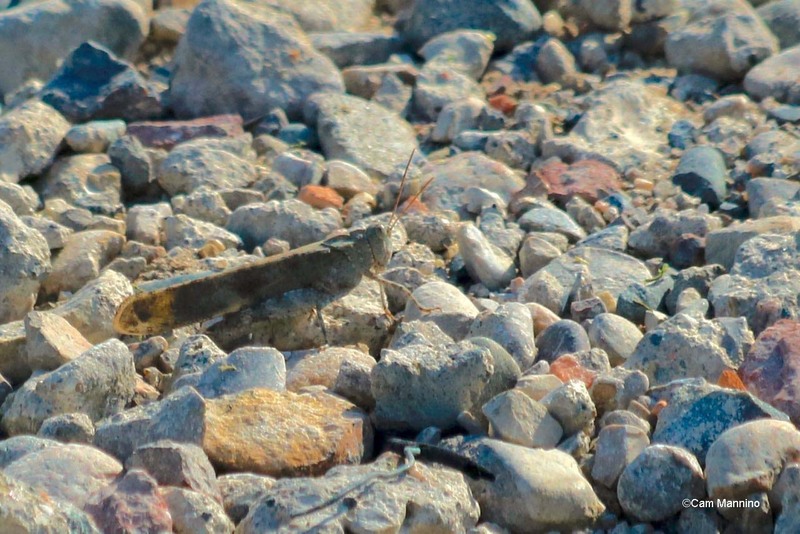 Carolina Locusts (Dissosteira carolina) spring into flight, their wings making a brown blur at your feet. Carolina Locusts fly up as your tread the paths of Gallagher Creek. 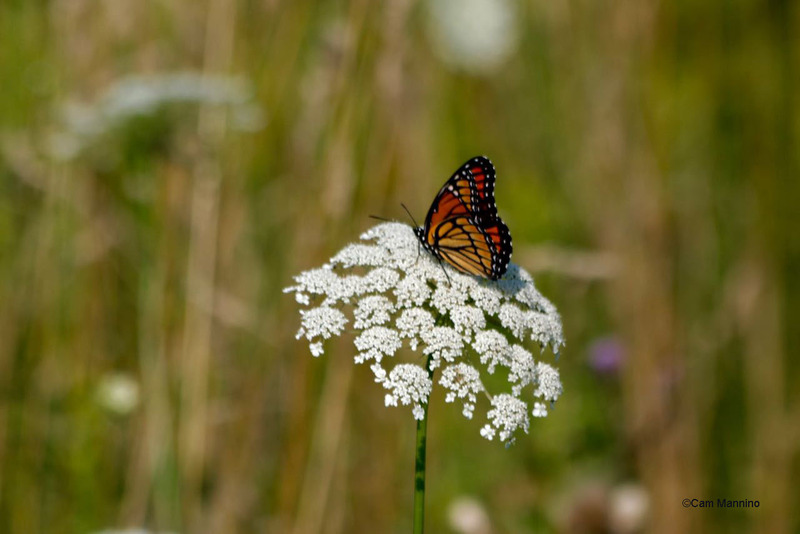 A Viceroy butterfly (Limenitis archippus) explored the possibilities of a Queen’s Anne’s Lace bloom one hot morning. Viceroys are distinguished from Monarchs by the bars on their hindwings. A Viceroy butterfly is distinguished from a Monarch by bars on its hindwings. 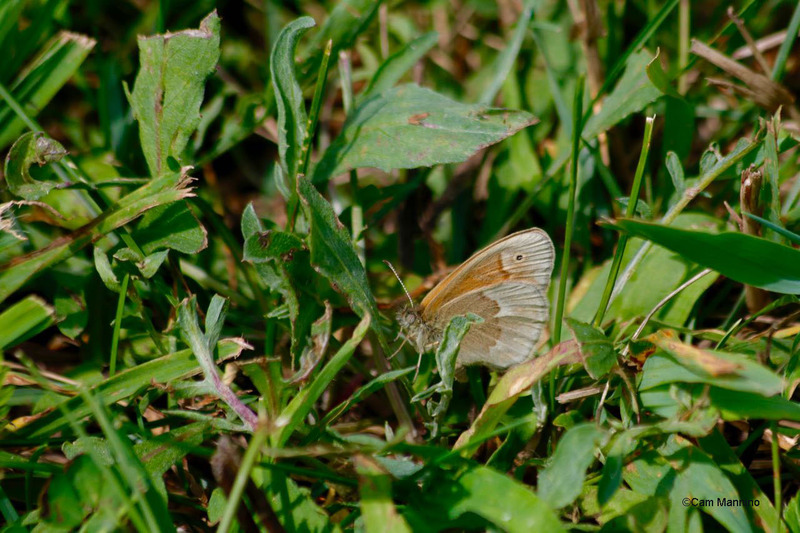 A Common Ringlet (Coenonympha tullia) hovered in the grass below. Ringlets aren’t the most efficient flyers but they are prolific, occurring in Northern Europe, Asia and across North America but not in the southern hemisphere . The Common Ringlet butterfly hovers close to the ground searching for nectar from small plants. Clouded Sulphurs (Colias philodice) have a larger range of flight, feeding on taller plants like the Milkweeds and Coneflowers, but also on alfalfa or clover closer to the ground. 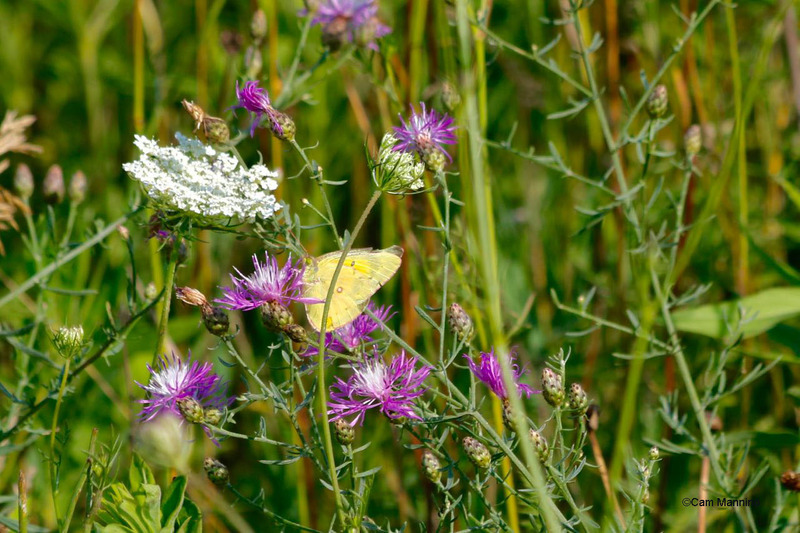 A Clouded Sulphur among the non-native Spotted Knapweed and Queen Anne’s Lace. So, this modest little park is actually a rich oasis of native plants and wildlife along an important cold water stream in the midst of the most developed area of our township. Joe Pye and Goldenrod complement each other near the creek where the reeds are growing in the background. The Parks and Recreation Commission has plans to put a pavilion and perhaps even a play area in Gallagher Creek to make it even more inviting to its neighbors. But right now, if you bring your binoculars and your curiosity to Gallagher Creek as the summer wanes, nature, as always, will reward you with lots of beauty to explore. Footnote:  My sources for information are as follows: Ritland, D. B., & Brower, L. P. (1991); Stokes Nature Guides: A Guide to Bird Behavior Volumes 1-3, Allaboutbirds.org, the website of the Cornell Ornithology Lab at Cornell University; Wikipedia; http://www.butterfliesandmoths.org; Herbarium of the University of Michigan at michiganflora.net; various Michigan Field Guides by Stan Tekiela; Butterflies of Michigan Field Guide by Jaret C. Daniels; University of Wisconsin's Bug Lady at www4.uwm.edu/fieldstation/naturalhistory/bugoftheweek/ for insect info; http://www.migrationresearch.org/mbo/id/rbgr.html for migration info; invaluable wildflower identification from local expert, Maryann Whitman; experienced birder Ruth Glass, bird walk leader at Stoney Creek Metro Park for bird identification; Birds of North America Online; Audubon.org; Nature in Winter by Donald Stokes, Trees in My Forest by Bernd Heinrich, Winter World by Bernd Heinrich, Savannah River Ecology Lab (Univ of Georgia); Tortoise Trust website www.tortoisetrust.org;  An Orchard Invisible: A Natural History of Seeds by Jonathan Silvertown; The Ecology of Plants by Gurevitch, Scheiner and Fox; other sites as cited in the text. This is wonderful!! It makes me want to run out the door to Gallagher Creek Park!!! Glad you enjoyed it, Cathy. Right now the park’s being prepared for fall seeding with native seeds, so it may look a pretty brown and bare. But if you look closely near the platform by the little creek or around the back of the park while you’re there and bring some binoculars, it’s amazing what’s already there! Also Ben told me tonight that some beautiful wetland plants are blooming just beyond the tree line to the east, deep in the grass so a bit hard to see. I’m going to look this weekend. This park has a lot of potential for being a family park for the neighbors. With a picnic area, maybe a small playscape, etc., as well as the plants and birds, it should grow into a real resource for relaxing in nature in a very busy area. Cam, thanks for another great post. You see everything. Chris, I’m glad you enjoy the posts. I WISH I saw everything! Friends like Ben, Antonio, other friends and my husband Reg have helped me a lot, though sadly Antonio has moved to Germany so I won’t have the benefit of his birding expertise in the future. And I’m still learning. And then of course, there are things I see, but can’t get with my camera. 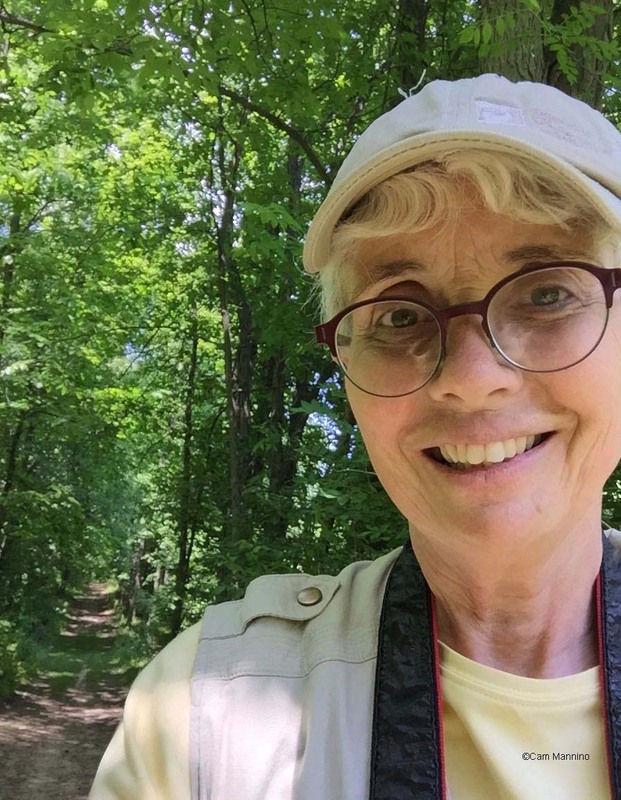 At Gallagher Creek, for instance, I twice saw either a bluebird or an Indigo Bunting – just a flash of blue – but I could never get a shot. But it’s always amazing to me, too, how much there is to see when I just bring my curiosity and look really carefully. Nature’s a terrific teacher as long as, like a good student, I pay attention! Thanks for the support while I explore and learn.